Webmaster Note: Saul passed away on Sunday, Oct. 30, 2005. This site will remain in place as a memorial to him. 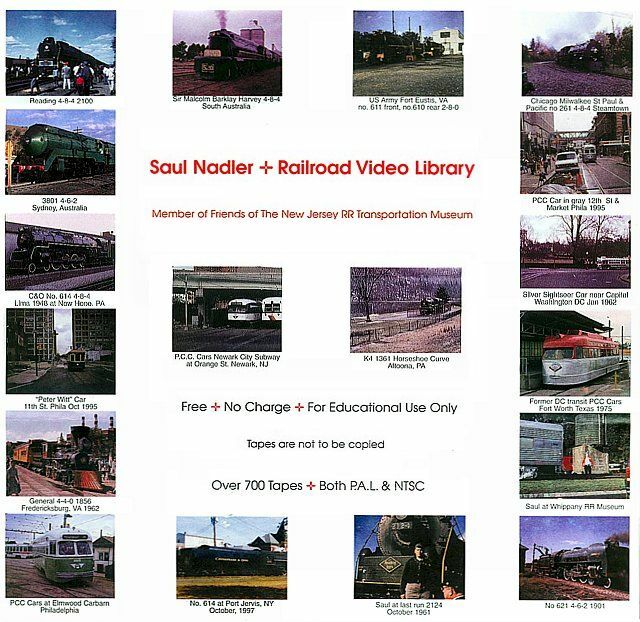 Saul will be greatly missed by the railfan community. All photos © Saul Nadler unless otherwise noted. Railroading in the Czech Republic. ZigZag RR Lithgow New South Wales AU. Old Steam engine FerroClub Argentina. Yatay taken by Miguel Moreno. W&NRR ran in Wharton and Rockaway New Jersey. It was one of the Iron Railways of NJ. The best Iron Ore in the world was found in these two towns. The problem was it was mined in very deep mines not on the surface as in the Mesabi Iron Range, all the mines are now closed in NJ. Historically, over 200 years ago George Washington was quite interested in these mines because of the high grade Iron Ore.
W&W No. 98 4-4-0 at Green Bank Delaware. Runs on Wilmington & Western RR, a museum/tourist RR in Delaware. 3 Ft gauge WP&Y equipment taken by Saul in August of 2003 at Skagway, Alaska. Narrow Gauge 3ft White Pass & Yukon Skagway Alaska. I took this picture Aug. 2003. Thailand Woodburner. Photo by Bill Dunn. Wanamaker, Kempton & Southern 2-6-2 #258. W. Germany Mallouf 1961 Monorail another view. W.Germany Mallouf 1961 Monorail another view. Taken by my wife Myrna in Baltimore MD. No 5 was painted to look like no. 5, The Wanderer, for WILL SMITH's movie "WILD WILD WEST", picture taken 1999. Modern Crane on CD RR from Jan Leimer of the Czech Republic. Diesel from CD RR Taken by Jan Leimer of the Czech Republic. Picture taken by Steve Jeffs in New South Wales, Australia. Metropolitan Vickers Electric locomotive which ran between Sydney and Lithgow in NSW. Saul's Collection. 1989 built Chinese steam locomotive 1647. No 1647 on valley RR when it was new, it now is No 142 of the NYS&W RR and now (2004) is running in New Jersey from Phillipsburg to Carpenterville (4 miles) on weekends. Taken in 1990 at Valley RR, Old Saybrook Conn.
Valley RR in Essex Conn. No103 2-6-2 Used to run in New York State on the Middletown & New Jersey RR to Unionville NY. NdeM Valle roundhouse or "casa rotundo" around Mexico City in 1968. US Army 2-8-0 No. 606 at Fort Eustis Va. in 1963 at Hanksyard. The US Army maintains a transportation Museum at Fort Eustis Va. There are still 2 steam locomotives at Fort Eustis Va.
Ferdinand Magellan pullman which was custom built for use by the President of the United States. Taken at Gold Coast RR Museum Florida. US Army 70 tonner, not certain where it came from. I took pictures of 611 in the spring of 1962 at Fort Eustis VA near the shop. You will see what is so special about this model S160 in the part2 photo . This engine has a "Caproetta" Valve gear. Some people call it a "Franklin Poppet Valve." This engine is now on display at TVRM in Chattanooga, Tenn. Here is a picture of the Franklin poppet valve on US Army No. 611, S160 design. USATC 2628 was its original number. It is a 2-8-0 which was donated to Texas State Railway in 1960 and is now at TVRM after a 1991 trade. US Army Transportation Corps Vulcan 0-6-0T in Jamaica in 1966. The young lad is the son of Carl Stratmann, the other founding member of the Jamaica Railway Society. He wrote a number of books under the pen name of "H G Forsythe" and recently passed away. Photo by Jeremy Browne, Adelaide, Australia. Union Pacific 4-4-0 no119 at Promontory, Utah's Golden Spike National Park. Taken in 1974 at Salt Lake City Utah, UP 4-8-4 No. 833 which was moved to Ogden Utah. It is a sister engine of 844 which is the only Class 1 RR steam engine which has never been retired in the USA. Union Pacific #3985 east of Topeka. "I AM THE LARGEST LOCOMOTIVE IN THE WORLD" "BIGBOY"
Union Pacific & SP engine on display near Ogden. Plaser American car is passing the area. Lucerne, Switzerland Trolley Busses in June 2005. Polvorin workshop in Buenos Aires. Picture taken by Miguel Moreno, Assoc Amigo del Tramvia runs on Sat & Sun Free of Charge, No Dinero, No money, you can ride all you want on the about one and a half mile round trip. I have a Video of this operation, has been running over 20 years in the Carbolitto section of Buenos Aires, Argentina. You can find a web site for amigodel tramvia, it runs thru City streets with a lot of traffic, one of the streets is rather wide. On some special days many people ride on the 4 cars. They have many fund raisers to keep it going, 700 railfans are involved with it. Texas & Pacific No. 610 (2-10-4) on Southern RR going to Monroe, Va, 1976 trip. Other cars in Newark City Subway. Joe Klein took this picture. Small tower car at Conn. Trolley Museum. PCC car from Toronto at Canadian Railway Museum, St Constant Quebec. I took the picture in 1961 on a Reading Ramble. TIPTOP at base station. Tiptop was going to climb Mt. Washington NH.